An egg is a beautiful thing. Smooth ovals in shades of browns, beiges and whites contain a wholesome array of essential vitamins and minerals. It is a protein powerhouse. In the hands of an experienced cook, they are useful in dishes savory as well as sweet. In the hands of an inexperienced cook, you can't go wrong with scrambled eggs! Whenever there is an egg, you can thank a chicken. When you know one personally, that's easier to do. Our backyard flock is kind enough to provide us with more than enough eggs and we provide them with chicken feed, green weeds pulled from the garden and all of our meal scraps. The chickens are as happy to receive our meal scraps as we are to gather their eggs. The white chicken will lay a white egg while the Production Red chicken's egg will be brown. While there are many uses for eggs, one of my favorites is to make Angel Food Cake. It uses a full dozen of egg whites. An egg white is an amazing thing. Also called albumen, it is a transparent liquid right out of the shell, but when air is incorporated by beating vigorously, it billows into a white fluff, increasing in volume by six to eight times. Generally fresh egg whites and those at room temperature have the greatest volume. There is no fat in egg whites and no butter, shortening or oil in Angel Food Cake making it a naturally low-fat dessert. In addition the the egg whites, it only uses a few simple ingredients; sugar (granulated and powdered), cream of tartar, salt, and cake flour. You'll find cream of tartar with the spices or the baking powder and baking soda. Homemade Angel Food Cake is far superior to any from a box or a bakery. Once you have made it, you'll know that it is really not all that difficult and well worth the time to make a special treat. Angel Food Cakes uses only egg whites, but don't throw away those beautiful, bright yellow yolks because the perfect companion to Angel Food Cake is Homemade French Vanilla Ice Cream and that uses a dozen egg yolks. Click here for my recipe. Yolks can also be used in Homemade Noodles. Separate the egg whites from the egg yolks. I do this by cracking open an egg over a bowl and sliding the yolk back and forth between halves of the shell while the white dribbles into the bowl. It is much easier to do than to try to describe. Be meticulous and don't allow any yolk particles in your whites. Yolks can affect the rising ability of the whites. Remember you'll only be using the egg whites for this cake, save the yolks for ice cream. Continue beating until the whites form stiff peaks. With a stand mixer, it is possible to over beat, so stop the mixer and check after 1-2 minutes. I usually touch the meringue with the tip of a finger. There may be a slight curl at the tip of the whites. If so, it not quite ready. Continue beating just until the tip is stiff and the meringue is still has a glossy shine. Meanwhile (and you may actually want to start this before beating your egg whites) measure: 1 cup cake flour and 1 1/2 cups powdered sugar into a sifter. Many recipes recommend sifting your flour and sugar together three times. I usually sift it onto a piece of plastic wrap, then pour it back into the sifter and sift it onto the meringue when I fold it in. That's twice. If you don't have a sifter, just stir together. Sifting simply mixes the flour and sugar together well and keeps the mixture light. It doesn't affect the flavor of the cake. Sift about a third of the flour/sugar mixture over the meringue. Using a spatula, gently fold by stirring in a bottom-to-top motion just until the flour is incorporated. The idea is to be a gentle as possible in order not to deflate the meringue. Repeat two more times. Gently spoon batter into a 10X4 inch tube pan. Bake at 375 degrees for 30-35 minutes until lightly browned and cake springs up when touched. Remove from oven and immediately turn cake upside down. My cake pan has little stands, but if yours does not, invert on a funnel or glass bottle until cool. Again, you are working to keep the cake from deflating and giving it good air circulation to cool. When cake has completely cooled, use a butter knife to go around the cake, separating it from the pan. Invert over a plate, give it a hearty shake and behold your beautiful cake! If desired, top your cake with a creamy glaze (recipe below). Now you have a lovely cake to enjoy. Melt butter. Blend in sugar and vanilla. Slowly stir in water until glaze is pourable. My husband's favorite dessert is angel food cake. It is such a simple dish. Thanks for sharing on Saturday Dishes. I hope you'll return this week when we feature strawberries. 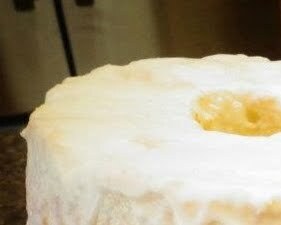 Angel food cake for Easter is a wonderful idea. Made this today for my mom's birthday. Can't wait to taste it! I love how you included your chickens in this post. We have 8 chickens and enjoy having them and their eggs! We also have 3 ducks we get eggs from. Making angel food cake is no big deal when you have chickens because there are always eggs! Yes, fresh eggs from the backyard are indeed a lovely thing. I'm sure your cake was wonderful. Happy birthday to your mom.